Rezaeyan, S., Rafati Alashti, M., Ahmadi Ghasem Kheyli, S., Khonsari, A., Nasiri Seyed, M., Abdali, N. (2014). The Study of Ultrasonic Waves on Dormancy-Breaking in Ferula Assa-Foetida, Ferula Gummusa and Myrtus Communis. International Journal of Advanced Biological and Biomedical Research, 2(Issue 4 (2)), 129-133. Sedigheh Rezaeyan; Mahsa Rafati Alashti; Somayyeh Ahmadi Ghasem Kheyli; Azadeh Khonsari; Mahdi Nasiri Seyed; Nargess Abdali. "The Study of Ultrasonic Waves on Dormancy-Breaking in Ferula Assa-Foetida, Ferula Gummusa and Myrtus Communis". 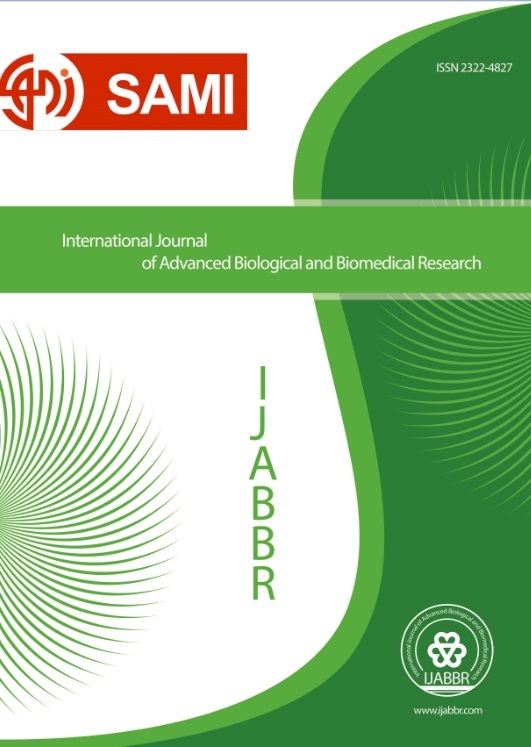 International Journal of Advanced Biological and Biomedical Research, 2, Issue 4 (2), 2014, 129-133. Rezaeyan, S., Rafati Alashti, M., Ahmadi Ghasem Kheyli, S., Khonsari, A., Nasiri Seyed, M., Abdali, N. (2014). 'The Study of Ultrasonic Waves on Dormancy-Breaking in Ferula Assa-Foetida, Ferula Gummusa and Myrtus Communis', International Journal of Advanced Biological and Biomedical Research, 2(Issue 4 (2)), pp. 129-133. Rezaeyan, S., Rafati Alashti, M., Ahmadi Ghasem Kheyli, S., Khonsari, A., Nasiri Seyed, M., Abdali, N. The Study of Ultrasonic Waves on Dormancy-Breaking in Ferula Assa-Foetida, Ferula Gummusa and Myrtus Communis. International Journal of Advanced Biological and Biomedical Research, 2014; 2(Issue 4 (2)): 129-133. Medical plants are adapted to different kinds of dormancy to survive in the worst situations. Regarding to ecological viewpoint, this kind of adaptation is very important in respect to restriction of genetic draft and decrease of genetic resource of medicinal plants. This leads to plant survival even after prolonged drought. Since some of them are endangered species and in the other hand increasing in the production and culture of medicinal plants this turns to a problem. To overcome this problem scientists apply different kinds of treatments (like heat, chemical and physical treatments).So to overcome the germination problem of F. assa-foetida, F. gummusa and Myrtus communis, four different times of 42 KHz ultrasonic waves (0, 4, 8 and 12minutes) were applied on the seeds of this plant. The experiment was conducted based on completely randomized block design with four replications. The collected data were evaluated by SPSS 14. The essential oil of seeds was obtained by hydrodistillation. Oil of the best treatment of F. gummusa was analyzed by GC and GC/MS. In the current study we reported the existence of F. assa-foetida in Oshtorankoh mountain for first time. Treatment Results showed that: There were significant differences between ultrasonic waves’ treatments (4, 8 and 12 minutes) and control (0 min). 30 days after treatments, the percentages of seed germination for each treatment of F. assa-foetida were 35, 75, 57/5 and 62/5% , for F. gummusa were 25, 60, 52/5, 45 and for Myrtus communis were 0, 42.5, 50, 35 in 4, 8 and 12 minutes ultrasonic waves’ treatments and control (0 min) respectively. In this study, 4 minute ultrasonic wave’s treatment clearly provides the best results for all species therefore ultrasonic waves method is a cost effective way for increasing seed germination rate in F. assa-foetida, F. gummusa and Myrtus communis. GC and GC/MS results showed differences in the composition of the essential oil of control and 4 minute treatment in F. gummusa.